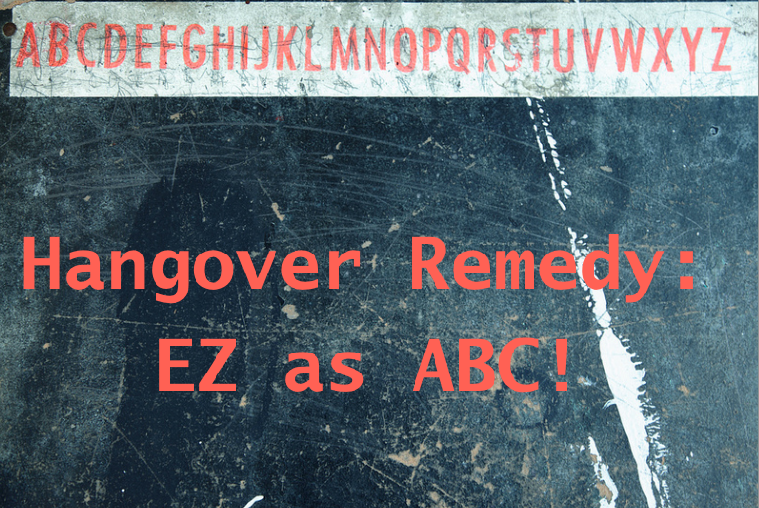 Hangover Remedy from Dr. Elson Haas EZ as A,B,C! We are big fans of Dr. Elson Haas of Preventative Medical Center of Marin, he is a pioneer in combining the best or western and eastern philosophies when it comes to healthcare with an emphasis on nutrition. Hence when his latest book was published, The Detox Diet, we had to share a few items with you. For not particular reason, we flipped right to “Hangover Remedies” 😉 Here’s the scoop. 1. If you’ve been drinking alcohol make sure you have a couple glasses of water before going to sleep along with vitamin C and a B-complex to clear the alcohol from the blood. 2. Repeat above when you wake up. 3. Evening primrose oil and flaxseed oil can also be helpful. So as a review ladies, when drinking (excessive) Alcohol, take (water) and vitamins B and C.
Frozen Fruits – Cost Saver Huge Flavor! As we say so long to summer and bask in the glory of fall, we also bid adieu to many of the brightly colored, highly nutritious organic fresh fruits. Hence we did a bit of research on how to freeze that last batch of summer fruit. Thanks to AllRecipes.com for their tips of freezing fruit. For fruits that tend to brown, like apples, peaches, nectarines and apricots, treat with ascorbic acid (Vitamin C). 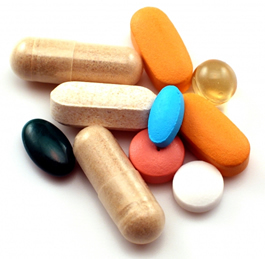 Look for the powdered form in health food stores, drugstores, and some grocery stores in the vitamin aisle. To make an ascorbic acid wash: Dissolve 1/2 teaspoon of ascorbic acid powder (or finely crushed vitamin C tablets) in 3 tablespoons water. Sprinkle this mixture over the cut fruit. An acceptable substitute: Slice the fruit and dip the slices in an acidulated water bath — about one quart water plus a tablespoon of lemon juice — before drying and freezing. For the elusive frozen bananas (ours seem to collect ice crystals and turn brown ;( ) We’ve gone to LiveStrong.com for their advice. 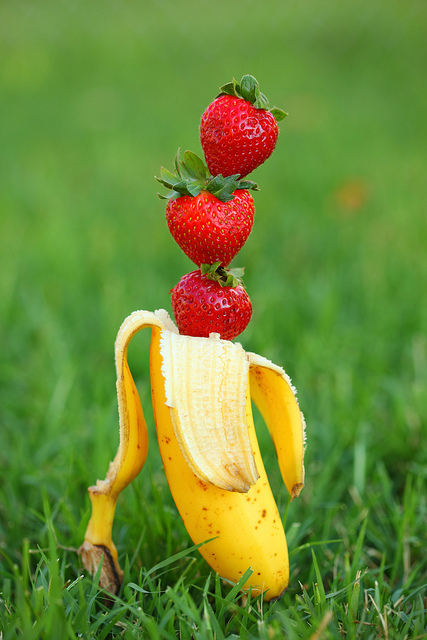 For preparation for smoothies they suggest peeling, cutting into 1/2 slices and putting on wax or parchment paper and place the banana slices onto it in a single layer and then placing the bananas in the freezer in a level spot for 30 minutes to an hour to solidify Otherwise, peel the bananas. (peeled frozen bananas can last up to four months, while those frozen with the peel last only two months) And place your bananas into a zipper freezer bag. Push as much air as you can out of the bag before sealing it shut. Don’t crowd or squish the bananas because it will make them harder to separate when you want to use them. As we were looking into sources of iodine – an essential mineral key to thyroid function – strawberries (after sea vegetables and a couple of others) were high on the list. 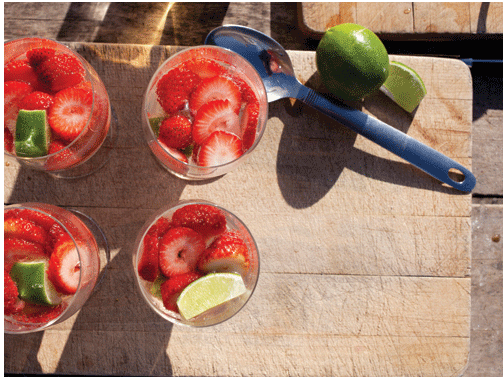 Hence with a nod to health, we present this delicious strawberry and lime soda, from chef Justin Everett of Cavallo Point. Of course a handful, of organic-fresh-from-the-garden berries would be healthier -but not nearly as much fun! In a medium-size pot, combine the water and sugar and heat until it boils. This becomes a simple syrup. Remove the syrup from the pot and cool in the refrigerator. Meanwhile, dice the strawberries into a large pitcher. Next zest the limes over the strawberries then squeeze all of the juice from the limes and add it to the pitcher. To finish, add the soda water and ice to the lime-and-strawberry mixture, then add syrup until you reach the desired sweetness. Stir well, and serve. Somehow iodine iodine iodine has become the topic du jour around the lunch table at work. No big mystery as one of our friends is having a thyroid issue, which then created a sudden interest eating foods rich in iodine – the trace mineral essential in thyroid function. (And of course it’s touted as the first line of defense against the nuclear radiation fall out from last year’s tsunami in Japan.) Since, we don’t want to accidentally OD by taking tablets, like some people do. We set out to find the best dietary sources. Duh! turns out iodized salt is a pretty easy thing to do… thanks Joseph A. Case for your detail-rich article. And as it turns out seafood is naturally rich in iodine, including; cod, sea bass, haddock and perch. Kelp (one serving of kelp offers 4 times more than a daily minimum requirement) is the most common iodine-rich green source, while dairy products and plants grown in iodine-rich soil can provide a bit of this nutrient … we digress. Keep it simple by snacking on it! 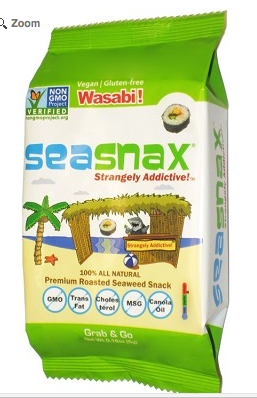 While those Trader Joe’s seaweed snacks are pretty good – if you can find Seasnax dried seaweed (Whole Foods, some health food stores, online) … these seem to score a bit higher w/ the online health brigade because they use olive oil -not canola oil in the process. And according to their website, on average, 15 micrograms of iodine can be found in a full sheet of nori. Just not into food from the sea? Here is a chart from The World’s Healthiest Foods on what they consider to be great sources of iodine. 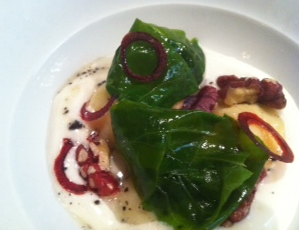 Did we miss your favorite iodine-rich snack or meal? Please share in our comments. You don’t have to spend hours at the CrossFit gym or sweat every morning in your Bikram class to make a dramatic healthy lifestyle shift. We’ve got three healthy eating tips you can include in your routine to make a big impact — this weekend! Yes, this isn’t revolutionary news — we all know it’s important to eat breakfast but why? If you diet first thing in the morning chances are you will overeat later in the day, says fitness guru and fitness author Jim Karas. Also, your ability to burn calories is kickstarted with that first meal. We’ve all been there — you’ve eaten a huge sushi dinner and just an hour later you’re starving. Instead of reaching for dessert reach for a low-calorie, high-water-content snack like sliced veggies or a whole wheat wrap with hummus, peppers and turkey. Avoid mystery foods like the all you can eat buffet or a chain restaurant’s pasta dinner — unless you’re making the food at home. It’s impossible to know just how much oil or even lard (shocking, yes — we have a summer restaurant job to thank for that info) is used in the recipes. If you are eating out choose plain proteins like a 6 ounce petite filet (about 11.2 grams of fat) or salad with no cheese, packed with veggies and dressing on the side. 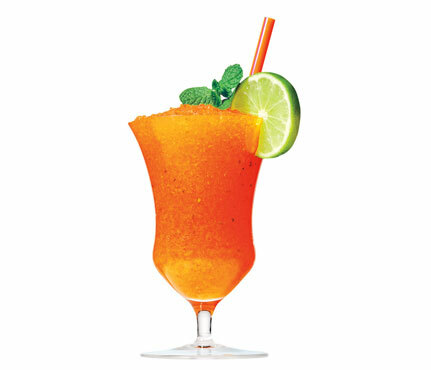 But it is the weekend, so if all else fails — indulge in a low-calorie cocktail like this 169 calorie skinny cantaloupe margarita. From the lips to the brain, alcohol is absorbed in under five minutes. Though alcohol affects every organ of the body, it’s most dramatic impact is on the liver. The liver cells normally prefer fatty acids as fuel, and package excess fatty acids as triglycerides, which they then route to other tissues of the body. However, when alcohol is present, the liver cells are forced to first metabolize the alcohol, letting the fatty acids accumulate, sometimes in huge amounts. Alcohol metabolism permanently changes liver cell structure, which impairs the liver’s ability to metabolize fats. Well, not so fast … As I listened to all of the miraculous health benefits (prevents cancer, anti-aging, detoxifying) I remembered a lecture at U.C. Berkeley’s nutrition dept. on the human body’s pH levels, which included my professor ranting about snake oil ‘pH balancing’ products available on the health food store shelves. What I’ve always remembered from this lecture -is that when stomach contents enter the intestine, they are neutralized and made alkaline by the pancreatic secretions — so all the water you drink eventually becomes alkaline. To be fair to Essentia, I did drink a bottle and it did taste great. And if you were to ‘google’ alkaline water it’s easy to see why so many people are happily chugging from their ‘pH-balancing’ water bottles in hopes of better health. Deepak Chopra, Tony Robbins and others have been inked to the magical powers … however, notice the source of the information–websites selling alkaline water or home alkaline machines. 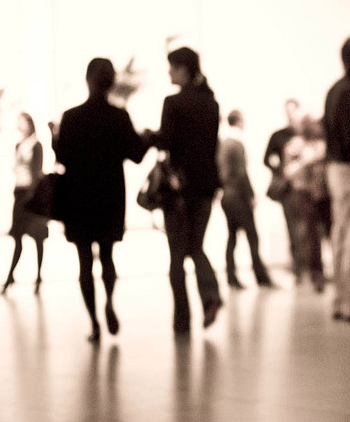 Complicating matters is the fact that most water ionizers and alkalizers are being marketed by multi-level marketing (MLM) companies with less than stellar ethics. They sell you a very expensive machine, for which you get a good discount if you sign up as a rep, and once you’re part of the MLM, you can’t very well change your mind about its benefits (especially if you’re going to sell the units) – even if you realize that the alkaline water is no longer “working” for you. And then there’s the big guns. The Mayo Clinic …. Alkaline water has a higher pH level than does tap water. Some proponents say that alkaline water can neutralize acid in your bloodstream, boost your energy level and metabolism, and help your body absorb nutrients more effectively. 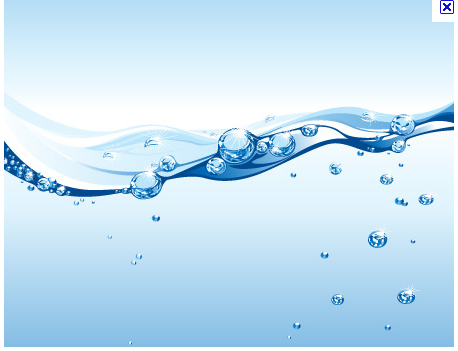 Others say that alkaline water can help you resist disease and slow the aging process. However, researchers haven’t verified these claims. Some research does suggest that alkaline water may slow bone loss, but further study is needed to determine if the positive effects can be maintained over the long term or influence bone mineral density overall. So ladies, as with every magic bullet – it’s best to make sure someone isn’t making a profit in the name of your health. Do you disagree? We’d love to hear from you. (from their website) We discovered when these six grains and legumes are sprouted and combined, an amazing thing happens. A complete protein is created that closely parallels the protein found in milk and eggs. In fact, the protein quality is so high, that it is 84.3% as efficient as the highest recognized source of protein, containing all 9 essential amino acids. There are 18 amino acids present in this unique bread – from all vegetable sources – naturally balanced in nature. Sprouting is the only way to release all the vital nutrients stored in whole grains. The sprouting process activates beneficial enzymes which cause the grains to sprout and become living and nutrient-rich. Stores of vitamins and minerals dramatically increase over the amount available in flour. Sprouting also converts the carbohydrates in grains into maltose, which is ordinarily done by the body during digestion, thereby predigesting nutrients for you. The enzymatic action enables the body to assimilate the vitamins and minerals more efficiently. Plus, the sprouting process naturally increases the protein content and decreases the calories and carbohydrates found in the original grain. Oh and about that supermodel secret. According to this Dr. Oz article these bible breads are a supermodels secret to Anti-Aging. A recent government report found that Americans aren’t getting enough calcium, fiber, magnesium, potassium, or vitamins A, C, and E. “You’re not going to have a major health event as a result,” says Alanna Moshfegh, an author of the USDA report What We Eat in America, “but the recommended amounts will help you maintain your health and decrease your risk of chronic diseases.” Here are the figures (as they pertain to women) and a little help interpreting them. Recommendation: 1,000 milligrams a day. Sources: Dairy products; fish with bones; dark, leafy greens. Recommendation: 25 grams a day. Benefits: Protects against coronary heart disease and reduces the risk of diabetes. 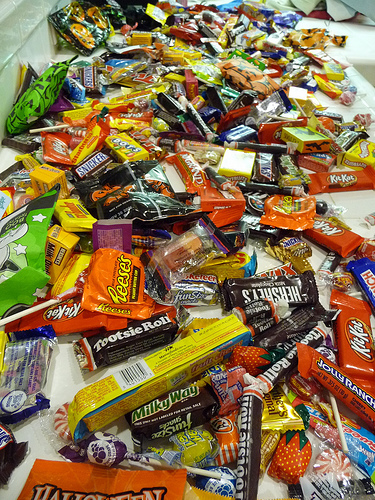 Sources: Fruits, vegetables, legumes, nuts, seeds, whole grains. Recommendation: 310 to 320 milligrams a day. Benefits: Helps maintain normal muscle and nerve function and develop and maintain bones. Sources: Nuts, seeds, bran, halibut and other fish. Recommendation: 4,700 milligrams a day. Benefits: Helps maintain healthy blood pressure and reduce the effects of salt; may reduce the risk of recurrent kidney stones and possibly decrease bone loss. Sources: Potatoes, tomato paste and puree, white beans, yogurt, soybeans, bananas. Recommendation: 2,310 international units a day. Benefits: Important for vision, red blood cell production, embryonic development, and immune function. Sources: Organ meats; orange vegetables; green, leafy vegetables. Recommendation: 75 milligrams a day. Benefits: Acts as a disease-fighting antioxidant; may help to maintain a healthy immune system. Sources: Fruits and vegetables, including citrus fruits, red and green peppers, kiwis, and guavas. Recommendation: 15 milligrams a day. Benefits: Acts as a disease-fighting antioxidant; may support eye health. Sources: Some ready-to-eat cereals, some oils, almonds, peanut butter.